Much of India’s startup success stories are skewed towards solving the problems of the urban middle-class. Be it an Ola, Flipkart or Paytm, they solve consumer pain points by offering a seamless and unobtrusive mobile app and internet purchase experience. And given their investor line-up, which includes some of the world’s biggest startup financiers, they are able to offer deep discounts. The frenzy surrounding these tech-enabled ideas is understandable, but are there entrepreneurial dreams that go beyond India’s urban middle-class? After all, only 200 million in a country of over a billion people can speak English and nearly 70 percent of India continues to live in villages. 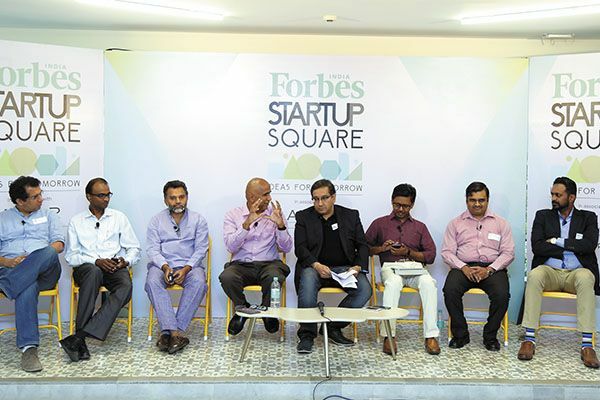 Sourav Majumdar: Is the startup industry only driven by valuations and not the need to address large-scale problems that have an impact beyond the urban middle-class? Nagaraja Prakasam (NP): There are enough problems out there; just get out and start looking. A lot of entrepreneurs are becoming lazy now. We all complain about garbage [in Bengaluru], so why isn’t anybody jumping in and solving the issue? Coming back to the real problems [mass problems], there is a frenzy going on. About $25 billion investment [overall net investment] took place in startups last year. We are a $2 trillion economy, so the amount of coverage and frenzy that happens for this $25 billion fund raising is crazy. Of the 1.2 billion people in India, 200 million speak English. You ask any startup, ‘How many people speak English?’ and they won’t know the answer. People are not digging deeper for data and search engines won’t give us this data. Students should get out of their buildings/campuses and go and talk to people, and see what’s happening around them. Majumdar: Are more people looking at such ventures? NP: We have wealthy people in the country who are coming forward to invest. When I started about four to five years back, I had about 20 angels supporting me. Today, all the 350 guys I propose a deal to want to close it in two hours. I’m really happy that the mindset is changing. K Ganesh (KG): I don’t think startups are about valuations. Entrepreneurship is of all kinds and forms. A cab driver or an auto driver is as much of an entrepreneur as any of us, who have been funded by venture capitalists. The problem, I think, is with the glitz and glamour [associated with highly valued startups]—a lot of which I attribute to the media. The real opportunities are in tier II and III cities. I wouldn’t say bottom of the pyramid, even though opportunities are there, but in the middle of the pyramid. I see huge opportunities and ideas that combine messaging, voice recognition, vernacular languages and mobile. I have a lot of respect and regard for people who play in the social sector, but again, the fundamental challenge down the road—whether it is the Series A round of funding or Series B or monetisation or even an exit—is how do those business models really get there? Ganapathy Venugopal (GV): We cannot take away from the fact that when an entrepreneur starts something, the ones who are passionate start with the intent of changing something for the better. There are enough examples of that. But there are a number of problems out there to be solved, and these are all tough ones. Recently, I was reading a headline in a national business daily that said that a large FMCG major’s profits were down because the rural uptake was low. Fifteen years ago, FMCG majors were grappling with a stagnant user base [largely urban centric]. But now the results of these companies are impacted by what is happening in the rural sector and that has happened because they have solved some tough problems: Innovated on products and supply chain. There is demand as well as some tough problems to be solved. If we put the spotlight on the right areas, I’m sure entrepreneurs will take up the challenge. Majumdar: Are there startups looking to use technology to solve problems in the social sector and agriculture? Rajesh Babu (RB): As the cost of technology is falling, we do see a lot of market linkage opportunities, even in sectors as traditional as farming. For example, a farmer has no idea what he should grow or what should be the price of this produce. We see a lot of entrepreneurs who are now creating this market linkage. Technology has evolved so much that a farmer can photograph his produce and its quality can be assessed just by looking at that. A lot of business models can be built in sectors like agriculture and dairy. Majumdar: Ajay, you work with so many tech startups. What has been the experience? Ajay Ramasubramaniam (AR): Technology is an enabler. It helps you grow and reach beyond borders and boundaries. But, at the end of the day, unless the core team is really equipped as far as the industry goes, it is difficult to scale beyond a certain point. When you look at scaling beyond a certain shape and size, unless you have a core team that is specialised in the sector or you have really strong investors and advisors guiding you in that direction, it is very difficult to build sustainable and scaleable businesses. Entrepreneurs who are building these businesses are not going after the right kind of people they need to get on board as mentors; they can guide them in building very fast. And what will happen is: Burning a lot of money in a short span of time and not taking the business to the logical growth. Majumdar: Ganapathy, can you share some insights from the perspective of Axilor Ventures, being an accelerator? GV: When we started out, we said we would look at three sectors—ecommerce and a couple of sectors, which have huge problems to be solved, but where there isn’t an investor or entrepreneurial interest. We chose health care and clean tech. But after two accelerator batches, one thing became clear—if we have to focus on sectors beyond ecommerce, it is not the general universe of entrepreneurs and startups that is going to give us ideas. We launched a directed challenge focussed on diabetes, and put out a research note that talked about all the possible innovations. And we weren’t looking for app-based solutions. Surprise, surprise, we got about 99 applications and out of that, 41 were from tier II and tier III cities. The jury told me that there were 12 good entries, of which we selected five and gave them a grant to set up their companies and pursue their ambitions. Majumdar: Umesh, you’re actually getting your hands dirty by trying to solve a real problem in the education sector. What are your takeaways? Umesh Malhotra (UM): I just think the excitement for people like me is the challenge. Creating an app is easy stuff; doing that is a lot easier than going out and solving a real life challenge of educating kids. Some of these challenges are much bigger than what we even imagine. Coming back to valuation, I can fully understand why VCs love the tech business—because there is a hockey stick growth. The chances of one [startup] becoming $500 million or $1 billion exist. So, if you’re playing that Las Vegas game, it’s the best place to play in. VCs in India today expect a company of five years to generate revenues of $100 million! I also sometimes think that the VCs are getting carried away with the spreadsheets, and their expectations are high. Basically, money is going where there is a true hockey stick growth model and where there is glamour. Majumdar: Sameer, can you share your experiences so far? Sameer Sawarkar (SS): There are quite a few challenges when we talk about rural India [villages with a population between 5,000 and 10,000 people]. So, our work is to provide health care access, connecting villagers to doctors through technology. In rural areas, people understand the quality of health care that is being made available, but at the same time, are unwilling to change their existing usage patterns. The struggle was in figuring out what works and what doesn’t. Because of their needs and behavioural patterns, the way people access health care is different across geographies. Majumdar: So there is a business model that works? SS: Absolutely! People pay for services that they take. And people are willing to access options and pay more. For example, if people want a particular doctor, they are willing to pay Rs 100 instead of Rs 50. So, there is a business model. However, I think there are multiple challenges that stop them [businesses] from getting extremely successful very fast. Some of the challenges are based on the regulatory frameworks. For example, nobody even now knows if tele-medicine is legal or not. It’s a long journey. And in terms of valuations, there are definitely difficulties in people [investors] seeing this as an opportunity. It’s not a hockey stick kind of growth, but a linear growth. Majumdar: I think that there is a clear difference between a venture and philanthropy. Are we getting confused between the two? KG: All my companies [startups] are not-for-profit! Some of the biggest valued companies—unicorns—are also the biggest not-for-profit companies! And that’s a lot of really good philanthropic work. (Laughs) Why would you end up trying to deliver an item, lose Rs 100, and then give it at a discount to the customer, unless it’s philanthropy? UM: I don’t think you should confuse business with philanthropy. I started Hippocampus with a motive of giving back to society. I remember dismissing people who said: “You should price more.” However, within a couple of years into the business, we understood that customers demanded a certain quality and were willing to pay for that. Majumdar: Rajesh, how important is it for startups that focus on semi-urban and rural issues to understand that there is a need to look at profitability? RB: What we insist upon is that their unit economics should work. Because trying to address problems without the unit economics in place can lead to trouble. And this is something we help them fine-tune and then scale up. Majumdar: Is it difficult to attract talent for such ideas and to get funding? RB: Once you have the economics in place, funding has been relatively better. Talent is a bigger challenge. Even in tier II markets, it is not that easy to attract talent. AR: So, we are seeing companies, which are not into ecommerce or app-based services, tackling more serious issues which are scaleable. And we are seeing interest for these ideas, not from the run-of-the-mill investors, but from investors who understand the magnitude of the problem being addressed. Majumdar: Ganapathy, do you see enough innovation happening in big impact areas such as health care? GV: I had done some research on the number of health care startups and what was apparent to me was: If you map access and affordability to rural, urban-poor and urban-middle class and also map which kind of innovation would be relevant to which kind of market segment, access is a big problem for rural consumers. There is a 1:10 difference in access for medical services in rural areas to what is available in urban areas. And affordability is a big problem for the urban poor. UM: I would like to add that there are two kinds of entrepreneurship. One is to solve a really big problem successfully and for that you have to dream big and you have to work big. The second is to solve a problem and show it as a replicable model. Solving a problem in a really big fashion has its own set of joys and it is extremely painful. But, that’s the ride we go in for! Majumdar: Do you see any real impact of the government’s Start-up India initiative? KG: The main initiatives are very well-intentioned. Some of them are not. For example, I like that there is a Rs 10,000 crore fund. If you are able to make sure that the money flows into impact funds, into areas which otherwise would not get access to the billions of dollars of tech-funding, it can be extremely useful. And the fact that they don’t want to run it and want to give it to funds is great.